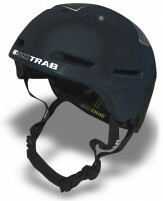 Goggle Clips - Elastic bungee retention system that installs on the Ski Trab Race Helmet to secure your goggles. Also works with headlamps. GoPro Mount - Use this to bolt directly into your Ski Trab helmet for mounting cameras or compatible lights. Winter Ear Pads - Fuzzy warm ear flaps to convert your Ski Trab Race Helmet into a mid-winter powder ski helmet.